1Give thanks to the LORD, for he is good, for his steadfast love endures forever. 2Give thanks to the God of gods, for his steadfast love endures forever. Then the passage goes on to describe His steadfast love and mercy to His people--the Israelites. 25he who gives food to all flesh, for his steadfast love endures forever.26Give thanks to the God of heaven, for his steadfast love endures forever. Those verses are full of praise to our merciful God for the way He shows His steadfast loveI would like to consider myself a merciful person...full of compassion to others. 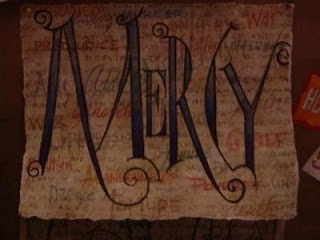 So I checked out the whole definition of mercy: compassionate or kindly forbearance shown toward an offender or an enemy. In Biblical terms it is defined in the following words: by the atoning sacrifice of Christ a way is open for the exercise of mercy towards the sons of men, in harmony with the demands of truth and righteousness. Through God's mercy, He was able to give us His grace to withhold what we as sinners truly deserve--this mercy continues daily to us! The speaker closed by reading a testimony from a lady in their church. This lady had been the top drug dealer in their town and had a life completely controlled and driven by drugs. She was arrested one day and sentenced to forty years in prison. A friend of this lady had come to know Christ and got her entire church to send this lady cards and notes in prison to show her Christ's love. After eleven years in prison, she became eligible for parole. The parole rule was that she had to have a stable home to go to. All of her family had rejected her, so she timidly turned to her Christian friend. This friend showed mercy and took the lady immediately into her home. They began to go through "Stranger on the Road to Emmaus" and within weeks, she accepted Christ as her Savior. Her relationships with her family members have all been restored and this lady has changed her life drastically and is now a thriving Christ-loving woman (with a real job this time)! To go back a little, her first Sunday in church, she realized that three of her biggest drug buyers were in church--they had all become believers as well! As the speaker closed, I felt really convicted about my *mercy*. I loved hearing this testimony and it really touched my heart. Would I be willing to befriend an ex-con / drug dealer and show them mercy--love and compassion? Why do I find myself willing to exert mercy to my friends who make a mistake here and there, but then I somehow draw a "line" of those sins that I just don't seem to find mercy to love have compassion for those people. It's only by God's grace and mercy in my life that I'm not the "ex-con / drug dealer" or what have you... I should be hunting down these people (hunting in love, of course) and showing them the kind of compassion that Christ exemplifies for us. I want my life to be a reflection of gratitude for the mercy, the endless love and compassion, that God continuously gives to me. I think I can only truly show that gratitude by exerting that same type of mercy to others. I need to be looking beyond my bubble for those people who need that steadfast love that comes from Christ. How cool would it be if I, too, could read a testimony from someone one day who came to Christ because of *mercy* being shown to them! thanks for sharing this. mercy is such an easy thing to accept from God and others, but it is so hard to remember that we ourselves need to be merciful as well.